The very sweet and talented Sarah of Sarah's Scribbles has given me a "Makes My Heart Smile" blog award. What a nice surprise! Thank you, Sarah. :-) I forward this award to the people on my blog lists. Please check them out. Visiting their blogs does make my heart smile. What is your horoscope and do you relate to it? I am an Aquarius. I don't follow my horoscope, but do relate to being an Aquarius. What are you wearing today? Hah! It's still early, so I'm in my pj's. I'm going to wear a navy cotton knit dress with long sleeves today. Not very interesting, but comfortable and cozy for a cool day. What was the last thing you bought? I just bought some supplies to make hat pins for teddy accessories. I also bought a new 5 lb. bag of excelsior, the stuffing I use for my critters. What do you think about the person who tagged you? Sophie is such a sweet, fun-to-be-with lady! I loved meeting her in person. We took the metro all over Paris, went to a teddy bear shop, and a wonderful craft store where we got some supplies (I also got a French card game. ), the huge department store Galeries Lafayette, and got apricot slushes at a Paris bakery. Sophie is a talented bear artist and photographer. She has a wonderful blog with beautiful photos. A guilty pleasure? Chocolate, of course. Also pear and peach Jelly Belly jelly beans. I used to buy the gianduja (hazelnut cream) filled chocolate oyster shells by Godiva and still look for gianduja chocolate truffles when I go to candy stores. What is your must have item for Summer? Comfortable sandals and a variety of Somerset magazines. If you could go anywhere in the world for the next hour, where would it be? Paris, my favorite, favorite city. What is your favourite piece of clothing from your closet? A turquoise shirt I made and appliquéd with dogs. What do you consider a Fashion faux pas? Nothing - go for it! Describe your personal style? Depending on my mood, simple and comfortable or arty. What are you going to do after this? Eat breakfast, then work on some teddies. What are your favorite past-times and hobbies? Reading, going to museums and art shows, going to movies. What are you proud of? Our daughter. We are so very proud of her. Have you got pets at home? 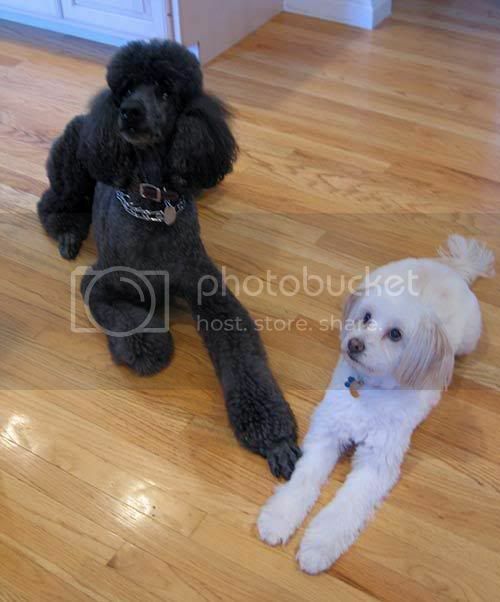 We have two sweet dogs, Benny an eleven-year-old black standard poodle and Chloe a little white mixed breed rescue from Puerto Rico (a SATO dog). I have been tagged by the very talented and equally sweet Danish bear artist, Tina, of Tiny Bears to tell six random things about me. Ever since I was a kid, I have been a board game fanatic. I love the graphics used on the board and in the cards and the sculptural quality of the playing pieces. I love playing the games and have a huge collection (including several vintage games). I grew up in St. Louis, Missouri - and miss it a lot. I have a small, but much beloved collection of Dal and Blythe dolls. I have two French speaking penpals -- one from France and one from Canada. I talk to the Canadian penpal on Skype every week - a half hour in English and a half hour in French. I talked briefly to Liam Neeson when he was filming "The Good Mother" (1988 - one of his first U.S. movies) with Diane Keaton in Cambridge, Ma. I always remembered how nice he was to a stranger. I followed his career and was so happy to see him become a major Hollywood star. Rules of the Tag: If you are on the list below you have been tagged to write 6 random things about you. I found this sweet video on YouTube and just couldn't resist it. The little girl is such a cutie. It brings back fond memories of toddler days with my now teenage daughter. Benny and Chloe are best friends. They hang out together; they play together. During the day you may find them asleep on the floor, their backs touching or Chloe's nose on Benny's leg. In the morning it is common to find them squished together on the same bed, although they each have their own. If one leaves, for a trip to the vet, for example, they seek each other out upon return and greet each other with gentle nose rubs. Chloe likes to jump up and nip Benny on his cheek and one of her favorite places to be is standing on her hind legs with her front paws draped over Benny's back. In the yard you can see them grazing together or jumping at each other, rear ends up in the air in an invitation to play. 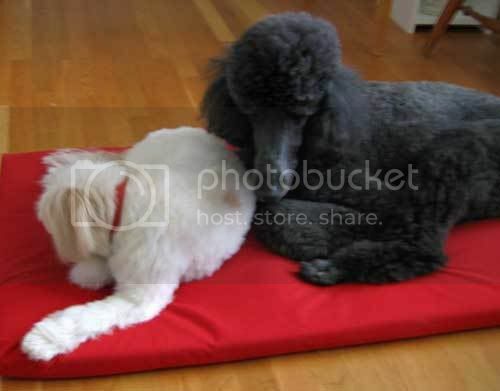 Benny is a 10 year-old large blue (called blue but is really a slate gray) standard poodle. He was wild and crazy his first three or four years. He is too smart for his own good and has always been "busy". He is high-strung, dominant, and very determined -- unpredictable with strangers, but very loving and demanding of attention with family and friends. One of Benny's big loves in life is dirty socks. He started eating them when he was a puppy and has had three operations to have them removed from his stomach. We bought three hampers with lids to thwart his sock-eating. One we put in the bathroom closet and the other two are in the laundry room. We discovered that he could lift up the lids, extract a sock and eat it with lightning speed. Now we have weights on all the hamper lids. Benny has gone through several training courses including a great "Come When Called" class and has had his share of visits to dog behaviorists (the doggie version of psychiatrists). 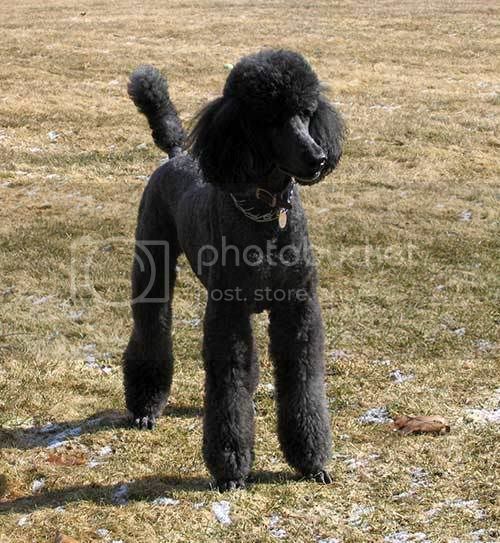 You can read more about standard poodles here. Chloe is a small (15 lb.) white mixed-breed with caramel coloring on her ears and tail. She was labeled "poodle mix" at the shelter and was mostly shaved except for a topknot on the top of her head. 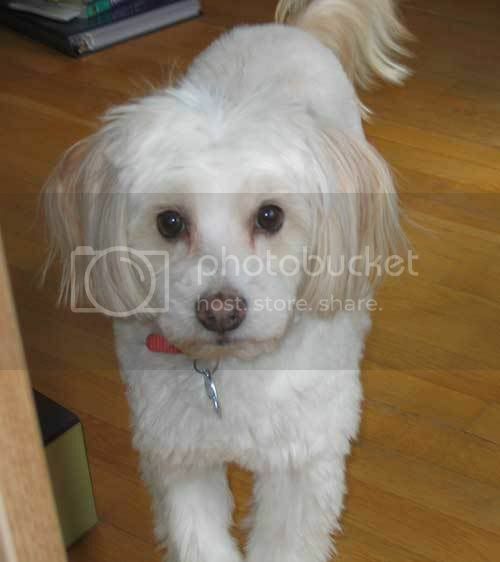 As her fur grew in, we discovered it was more the texture of a Maltese or Havanese. She is about 5 years old. We got her at the Northeast Animal Shelter, a no-kill shelter in Salem, Massachusetts. Chloe is a SATO dog, a rescue dog from Puerto Rico. (Sato is the Puerto Rican slang for mixed-breed street dogs.) She was found on a median strip of a busy street. It was reported on her information papers that she had been trapped there for five days. She was terrified of cars for a long time and when cars passed us on our walks practically did flips on her leash. We adopted her on a Friday afternoon. Sunday morning we were at the animal hospital because she was lethargic and wasn't eating. Tests revealed she had ehrlichiosis, a tropical tick-borne disease that attacks white blood cells. It took 5 months and several courses of antibiotics until she finally kicked the disease. She has been healthy since. She is a sweet, gentle dog and loves everyone. Benny and Chloe are "partners in crime". 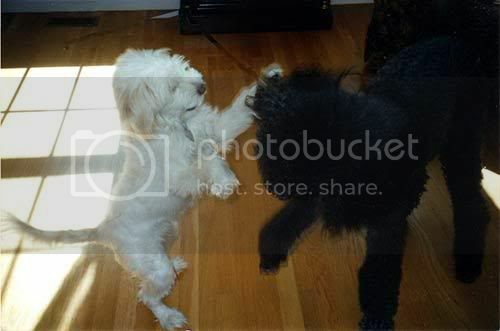 Benny showed Chloe how to get into the garbage -- knock over the pail and pull everything out onto the floor. We are very careful to put things away, but if we forget and leave bread out on the counter, Benny will pull it down and then Chloe will help him eat it. They both love kleenex. Chloe rips it up into tiny pieces, but Benny eats it. They have to be confined, (Benny to a crate and Chloe in the room) when we're not home. Chloe foraged to survive when she was in Puerto Rico. She continues the practice in our yard. She loves onions and squeezes through our wire garden fences to pull up large stalks of Egyptian onions. She also likes tulips. Although Benny had never bothered plants in our yard before, he decided it was a good idea, and soon started eating onions, too. We had to pull out all our onions when our vet informed us that they are very toxic for dogs. We have to watch each summer for our raspberries, strawberries, tomatoes, and plums to ripen and harvest them quickly, or the dogs get them all. Chloe also taught Benny to "sing". Our daughter plays the piano. Every morning Chloe would come into the living room with her and howl to Beethovan or Chopin. Soon, Benny started chiming in and now our daughter plays to the accompaniment of their chorus.